New Year's Eve Celebrations in the Suncoast! There is no place better than the Suncoast area to ring in the New Year! Fill your weekend with festive fun at one of the great New Year's Eve events occuring in communities throughout the area. Celebrate the end of 2016 and the beginning of 2017 with your family and friends at one of these celebrations. Come to the largest New Year’s celebration in the Suncoast. There will be a midway with family carnival starting at 1:00 pm. Spend the day listening to live music, enjoy delicious food from local vendors and restaurants, and partake in fun activities and games. At midnight, watch the Pineapple Drop at the corner of Main Street and Lemon Avenue. Your family will love celebrating the New Year in a winter wonderland at the White Cottage. Stay warm in the “snow” with bonfires, roasted marshmallows, and hot chocolate. There will also be crafts and fun activities. Your whole family will dance the evening away to music by Sean Phillips. Marina Jack is the place to be on New Year’s Eve. All of the venues have special events and dining packages offered for the evening. Enjoy live music by musicians and bands, such as Off the Cuff, Rock Lee, Kettle of Fish, and The Groovehounds. Of course, there will be delicious food served. For reservations, call (941)365-4232. At the end of the night, stay for an amazing fireworks show at midnight. Can’t make it to Marina Jack? The fireworks show can be viewed for free anywhere from downtown Sarasota! 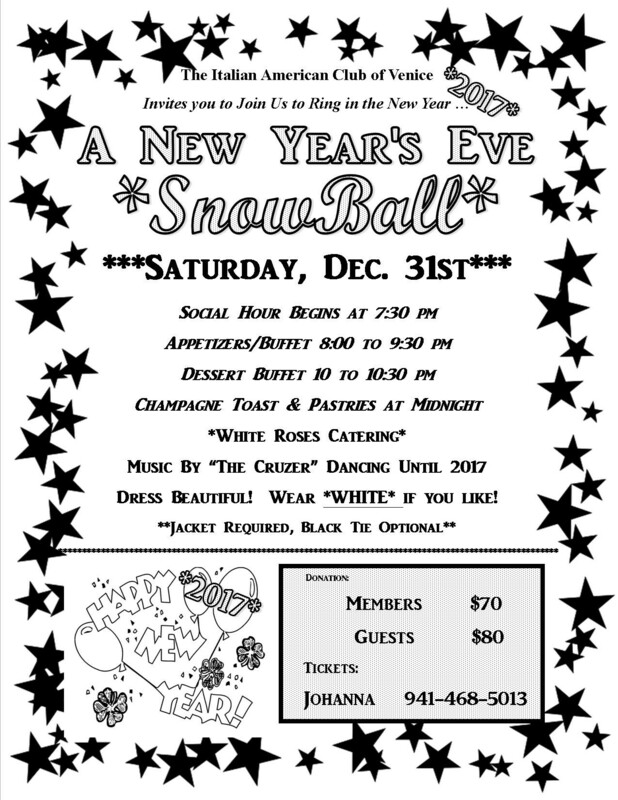 New Year's Eve "Snow Ball"
Ring in 2017 at the Italian American Club of Venice at the “Snow Ball”. Dress to impress! It is recommended to wear white! A jacket is required and black tie is optional. The evening will begin with delicious food before the celebrating begins with dancing and live music from The Cruzer. Midnight will be greeted with a champagne toast. For tickets, call Johanna at (941)468-5013. Party on New Year’s Eve at one of the most perfect settings in Venice! Enjoy an evening on Venice’s fishing pier with live entertainment from dance band Chameleon. There will be party favors and a spectacular fireworks display at midnight. Grab a bite to eat before the party by placing a dinner reservation at Sharky’s On The Pier. Have a New Year’s Eve that you will never forget! The Walsh Family is hosting a black-tie event at the beautiful Gardens. Your evening will be filled with the spectacular Lights in Bloom display, a delicious four course meal, dancing, and live entertainment. There will be a special performance by the Sarasota Ballet! At the end of the night, enjoy fireworks over Sarasota Bay. Tickets can be purchased HERE. Wishing you a very happy and prosperous 2017!